This offering from the combined forces of Musica Amphion and the Gesualdo Consort is presented as a hardback book with a CD tucked into the back cover. It is the second in the Bach in Context series. 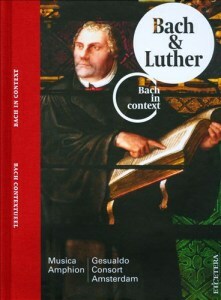 The aim of the project is to present Bach’s works in a liturgical format. The book goes to considerable lengths to explain Lutheran liturgy and how Bach’s compositions would have fitted into a Sunday morning service, thus presenting a prelude, cantata, choral, motet, choral and postlude - in this case the fugue. The performers also give concerts using this format. Whilst the book contains essays on Bach and Luther the continuation of an established tradition and Silbermann organs one might a feel a little short-changed. Each double-page spread has English text on one side and Dutch on the other, and a significant number of pages are given over to photographs and biographies of the performers. The content of the essays is interesting and well written, however, it is unclear quite who the target audience is. The discussions presented do not say anything that isn’t available in publications available to scholars and students, whilst it is rather in-depth for an enthusiastic amateur. One issue that the book raises is that of the continuing discussion about the forces that should be used to perform Bach’s cantatas. The choice for this performance is one singer per part. There are various arguments in support of this - and plenty against - but the recording demonstrates the flexibility and delicacy that individual singers can bring to the table. The fabulous counterpoint of the first movement of Ein Feste Burg is skilfully woven by the singers and instrumentalists in perfect balance. The chorale melody, played by the pedal reed, cuts through the texture but doesn’t overpower the singers. The same forces treat the second cantata, Christ lag in Todesbanden, in a sensitive manner and the way in which each part is equal in the accelerando is very commendable. This is a direct contrast to the recording by the Amsterdam Baroque Orchestra and Ton Koopman (Challenge Classics CC 72201) which uses large forces and therefore there is far less control over the accelerando. Although, given that during this “service” the choir are performing J.C. Bach’s double motet, one could assume that Bach would have used eight singers if they happened to be available. The motet, written by Bach’s great-uncle, is a very enjoyable piece. The intonation and accompaniment are spot-on. The only criticism is that sometimes the harsh consonants are exaggerated unnecessarily which interrupts the flow of the line; however, the diction is very clear which is preferable to the other extreme. The organ works on this disc are performed on the recently restored Silbermann organ at St. Georgenkirche Glauchau. The sounds produced are well chosen by the performer; the book is unclear about who this is, either Pieter-Jan Belder or Leo van Doeselaar. The “Silbermann” tuning takes a little getting used to but certainly emphasises modulations in the first chorale prelude Dies sind die hel’gen zehn Gebot. The Dorian Toccata and Fugue is very enjoyable and displays the perfect balance of the instrument’s divisions in the Toccata. The Fugue is taken at an unhurried pace and the articulation of the pedal means that the parts are well balanced. The player could have enjoyed moments of tension more by slowing into them, but this is a very majestic performance and ends the programme with gravitas. Overall, this recording seems more worthwhile if the book is considered as just very extensive CD notes. The increased price may discourage people from listening to some very worthy performances, whilst the book doesn’t contain anything earth-shattering. The liturgical order of the tracks is probably more easily appreciated in live performance but means that there is a nice selection of music on one disc.